Ever since I created a blog planner (click here for a free download), I've been tracking my blog stats more closely than usual, and since I am sort of an Excel nerd, I needed to analyze my growth. Of course, when you start to look at stats it only leads to more questions. Let me first say that I was inspired by Carla at Real Into who shares her monthly blog stats each month. I thought it was refreshing for a blogger to be so open and honest. For some reason, I think we tend to think of our stats as something that we need to keep closely guarded, although I am not sure why? It's kind of like running. What if I ran a 5k but I decided not to tell you my finishing time in case you did better, because that would make me feel bad. Silly, right? As a blogger, there will always be someone bigger and someone smaller. Kind of like life. Stats aren't some big secret that need to be guarded. They are what they are. I wanted to talk about them because I have questions. I wonder if you see the same sort of trends on your blog that I see on mine. I started really tracking my stats and followers in February, so I was looking at how my stats changed from February to March, and then March to April. My current stats are in the yellow highlighted column. I get my unique visitors, visitors and page views stats from Google Analytics. As you can see, I was pretty flat from February to March, but saw a significant increase from March to April. I have no idea why. All I do know is that 50% of my traffic comes from Pinterest. 50%! That is huge. That means if Pinterest didn't exist, I would have half the blog traffic that I have today. The lesson here is that if you are not optimizing your posts for Pinterest (pinnable, portrait images with light backgrounds) then you are missing an opportunity for increased blog traffic. I do think that my increase in uniques came from Pinterest, so I suspect that they could drop just as quickly as they grew. We'll see. Then we move onto my social media followers. My top social media growth platform was Instagram. This is no surprise to me as I am very active on Instagram and I proactively try to grow my following. It is no surprise that the platform that I give the most focus grows the fastest. I use the just unfollow app to follow new like-minded accounts, and unfollow most people who don't follow back. Bloglovin' is sort of a mystery to me because I never do anything to promote that platform except for a button on my sidebar, but it seems to grow pretty well on it's own. I may have added my Bloglovin' link to a SITS Girl thread on Facebook once this month, but that's it. It is decent growth for something I don't give a lot of attention. Even though Pinterest has been a huge traffic source for me, it is another platform that I don't make any effort to gain new followers. I work hard to create images for my blog posts that are pinnable, but I don't go out of my way to attract new followers. I think a 7% for a completely organic growth is pretty good. I wonder how I could do if I tried to grow my following. I think Pinterest is probably the most important social media platform for bloggers. Anyone have any tips for growing your Pinterest following? Twitter is another platform that I actively work to build my following. I have been averaging 500 new followers a month or a 7% growth each month. I am pretty happy with this, I just can't wait to hit 10K. 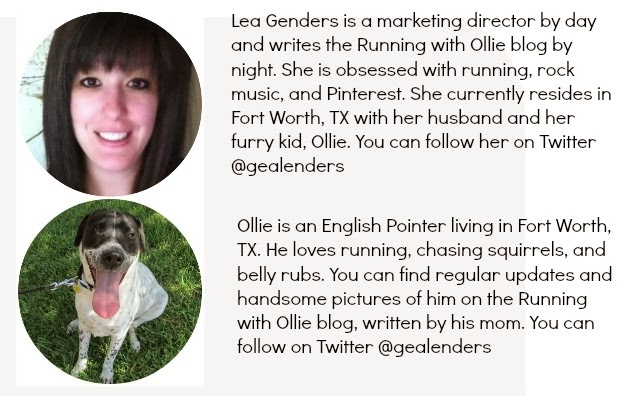 My Twitter handle is @gealenders. Check out my tips on how NOT to grow your Twitter following. Most of these tips are so simple, but lost on so many. My Google+ growth is completely organic. It seems to be building over there slowly, but surely. I think I was a little late to the Google+ game and now I am playing catch up. My growth in March was a little slower than in February. Oh, Facebook. My slowest growing social media platform. I am completely annoyed and frustrated with the lack of growth on Facebook. It took me a year to rebuild to over 3k fans on Facebook (when I changed my blog name to Running with Ollie) but my posts usually only get "seen" by 300-500 people. It is so different than it was a year ago when it was one of the largest traffic sources for my blog. I still use Facebook to interact with my blog followers, but I have completely given up on any attempts to try to grow this platform. I wrote a post on tips to increase likes and engagement on your Facebook page that I think are effective, but generally, I figure my time is better spent elsewhere. What is your fastest growing social media platform? What is most frustrating? Do you have any social media insights that I am missing? If you follow me on social media, I'll follow you back! In case you missed it on all my social media platforms, Ollie and I are currently hosting a reader appreciation giveaway for a $50 Visa gift card. Check out the blog post to enter and win. I had quite a bit of growth during my last giveaway period that just ended, where people would subscribe to Bloglovin for an entry, or to follow me on various social media sites. I had offered those options before but this time, Bloglovin took off. I think maybe people are starting to consolidate their blog reading there rather than relying on catching the blogger's latest post on Facebook, since they are hiding activity from "pages". I worked to grow Twitter and become engaged on it with others and enjoy it, then Instagram, then Facebook. I have not done anything with G+ since I really don't like it, although I hear it's "important". I might need to make it my April focus to figure out how best to use it! I read that G+ is important because what you post there can be found in Google searches, unlike Facebook and Twitter. It seems to me only bloggers are there now, but since bloggers are a big portion of my readers, I think it is worth it to post there and poke around now and again. yeah, PInterest is huge for me! I have also found that pinning to "group" Pinterest boards and not just your own boards helps a lot too! Good luck! Yeah, great post thank you so much for sharing. Do you Pin your own posts to Pinterest or does that just happen organically through your readers? Everyone says what a source it is but I don’t really think I use it the right way with my blog… And also, I think a lot of people are afraid to share their stats in case they are way smaller than everyone. I’m always curious though! Rad to see such openness! I definitely PIN my own posts! I look at it as sharing my links on social media, just as I would on Facebook or Twitter. It has been huge for me. Thanks for sharing! I'm SUPER new to blogging...like a week old and basically started it as a motivational tool for myself and others who are in a similar situation transitioning from being "someone who jogs" to a commitment to running and racing. It's very interesting to see a successful blogger show their stats and traffic sources as it helps us neophytes learn where to focus our attention! hey! first of all, thanks for calling me "successful" lol. I think my next social media sunday post will be all about Pinterest, so stay tuned! Good luck with the blog! Leave your link so we can check it out! Thanks! Thanks for your post. It's great to see someone being open about their stats. To be honest as a newbie blogger, the stats are still pretty confusing to me. But the one thing I seem to learn repeatedly from people is that Pinterest is key. That is something I definitely plan on working on. This is such a helpful guide! Thanks so much for sharing your stats...it's really insightful! Facebook seems to be a real bummer thanks to the powers that be...I've read that Pinterest is the secret to growing followers! Great job!